WITH a name like Hibernian a tempting assumption might be that the first non-Scottish player to have won international honours while on the books at Easter Road was an Irishman. But Bobby Atherton – the last man to have held aloft the Scottish Cup as a Hibs captain – made history when he was capped by Wales in 1899. Atherton's international record contributes to an illustrious roll call of past and present Hibs players who have won caps while playing for the Edinburgh club, and their achievements are being celebrated in a new exhibition at Easter Road, They played for their country – Hibernian internationalists through the years, collated by the Hibernian Historical Trust. Collectors items on show include a Franck Sauzee France strip, Franz Beckenbauer's West Germany shirt from a 1974 friendly against Scotland, shrewdly acquired by Alex Cropley, a substitute that day, and a 1973 Scorcher front page transforming the stern features of Eddie Turnbull into a cuddly comic character. It is tales such as Atherton's, however, that stir particularly powerful emotions. Born in Bethesda, north Wales, the year after Hibs were founded in 1875, Atherton was raised in Scotland and signed for Hearts before crossing the capital divide for the 1897/98 season. He won his landmark cap against England in 1899, then captained Hibs to the 1902 trophy that has eluded them for 106 years since, before adding a league winner's medal the following year. Atherton won four more Wales caps while at Easter Road before he moved to Middlesbrough, but his life ended tragically during the First World War when his ship, the Britannia, sailing out of Leith, disappeared without trace in the North Sea in October 1917. The serviceman was assumed drowned. The story of James Main is similarly poignant. Main won his first Scotland cap in a 5-0 win at Hampden over Ireland in March 1909, and more honours seemed certain to follow. But playing for Hibs against Partick Thistle on Christmas Day that year, he was kicked in the stomach and carried off the pitch. It emerged that night he had ruptured his spleen, and he was rushed to Edinburgh Royal Infirmary, only to die two days later. His memorial service concluded "it is hard on the Hibernians to lose such a capable and exemplary player". The first Hibs players to pull on a Scotland jersey were inside right James McGhee and James Lundie, both selected to face Wales at Hampden in April, 1886. Lundie scored an own goal in a 4-1 win for the Scots, and he and McGhee were never capped again. However, both played in Hibs' first Scottish Cup win of 1887, with McGhee captaining the side to victory over Dumbarton. For 14 years after Main's death, Hibs failed to field another international, but the talented team of the 1920s was built around Scotland quartet Willie Harper, James Dunn, Harry Ritchie and Peter Kerr, while the next decade produced the Irish trio of Jack Jones, Willie Gowdy and Patrick Farrell. Internationals during the Second World War were confined to fixtures between Scotland and England, but the legendary Matt Busby – guesting for Hibs – and Jimmy Caskie became the first Easter Road players to be capped during wartime, in a 2-0 defeat at Wembley in 1941. Post-war, the Famous Five were in full bloom and all of the quintet were to contribute to Hibs' haul of caps, along with the brilliant Bobby Combe, another star of the celebrated Fifties side. Hibs great Lawrie Reilly holds the distinction of winning the most caps while at the club, the first of his 38 Scotland appearances coming in a 3-1 win against Wales at Ninian Park in 1949 and the last in a 2-1 defeat against England in 1957 – the only time he failed to score at Wembley. The Twin Towers also witnessed the first appearance in an England shirt of the famous Joe Baker, Liverpool-born but Scottish to the core. The teenager duly scored on his debut against Northern Ireland – the first England player to have done so without having played for a team from inside its borders. Baker would win only seven more caps however, some of which can be seen at the Easter Road exhibition, and although he was included in the initial squad for the 1966 World Cup, he missed the cut for the final 22. Turnbull's Tornadoes, the swashbuckling team of the Seventies, was the last Hibs side to generate internationals en masse, and Cropley, Jim Herriot, John Brownlie, John Blackley, Erich Schaedler, Arthur Duncan, Des Bremner, Joe Harper and Pat Stanton all contributed to Scottish success, while Alan Rough's second-half appearance in the fateful 1985 Cardiff game that culminated in the tragic death of Jock Stein, was a rare appearance from a Hibs player in that decade. Only a select handful of Easter Road players have won full international honours with Scotland since, notably former manager John Collins, but surprisingly Jim Leighton and Darren Jackson, are second and third behind Reilly in the list of caps won while on Hibs' books, with 23 and 20 respectively. 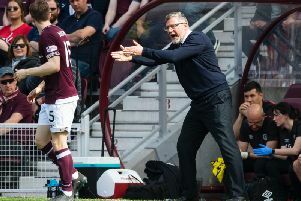 The Bosman era has ensured that modern-day Hibs managers have waved players off on international duty to countries as diverse as Canada, Morocco and Ecuador, but current manager Mixu Paatelainen – whose XL Finland shirt sits proudly in a display cabinet – would gladly be responsible for adding a few new names to that list. &#149 The exhibition, They played for their country – Hibernian internationalists through the years, can be found on the first floor of the Main (West) Stand at Easter Road. It is open tomorrow and every Sunday up to and including 29 June from 2 to 4pm. Admission is free. The Hibernian Historical Trust is always looking for memorabilia, donated or loaned. Contact Tom Wright on 0131 556 6820.